The National Fire Protection Administration is a not-for-profit organization that writes standards regarding health and safety issues for fire service and related organizations. NFPA 1999 is the standard on Protective Clothing for Emergency Medical Operations written by the Technical Committee. The standard outlines performance criteria for clothing to protect providers of emergency medical care with protection against liquid born pathogens such as HIV, AIDS and Hepatitis. The NFPA standard outlines performance criteria for the garments and quality standards for the manufacturers. The required quality assurance program is the ISO 9001:2015 standard. The ISO 9001:2015 standard is an internationally recognized quality system that encompasses every aspect of a business. A myriad of performance tests are performed by independent third party labs to assure quality and performance. Additionally, third party labs perform on-site audits every six months as an added quality check. Gerber Outerwear was the first company to be certified to the NFPA 1999 standard and has been certified to the NFPA standard for 14 years with no lapses in certification. Gerber garments are worn by the leading providers of EMS in the United States and Canada. A list of references is available on request. 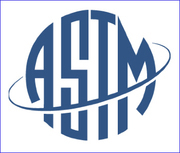 The American Standard Test Method F 1671 is the independently performed procedure that determines if the barrier fabric used in the construction of PPE is impervious to penetration of petentially harmful Blood Borne Pathogens. OSHA requires in their final rule 29 CFR 1910.1030 that an employer must provide appropriate protective equipment that will not permit blood or other potentially infectious materials to penetrate through to reach the empolyee's work clothes or skin. This is a nationally recognized test method performed by independent labs to confirm the protective characteristics. 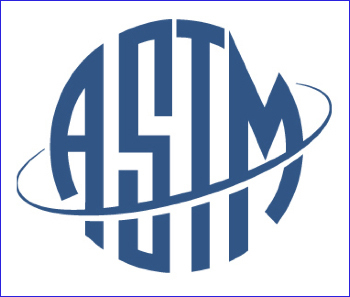 The ASTM F 1671 test defines a method to evaluate if these potentially harmful blood borne pathogens can penetrate a protective fabric. The test utilizes a surrogate virus, Phi X 174, in a closed cell that is capped by the protective fabric. After a set time, the lab technician scientifically determines if any of the infectious materials have penetrated the barrier thus determining a pass or fail result. ISO is recognized as the short name for the International Organization for Standardization, an international agency consisting of almost 100 member countries. Representative members have worked together to develop a model quality assurance plan. The model quality assurance plan is the ISO 9000 Quality System. The ISO 9000 Quality System is a group of five clauses that provide guidance in the development and implementation of an effective quality management system. The five groups create a framework for individual firms to build their own specific quality system upon. To ensure that a quality management system is in place, the organization must demonstrate compliance through third party registration. Registration is performed by an independent firm that comes into the organization to "audit" the system. Complying with ISO 9000 standards shows that a firm is capable of meeting customers' product and service expectations in a highly consistent manner. 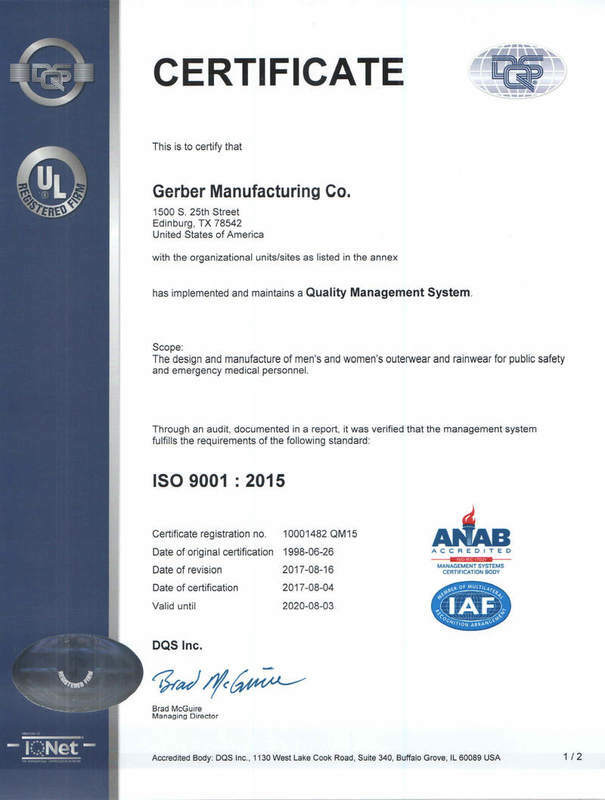 Gerber Outerwear has been an ISO registered firm since 1997. Gerber's commitment to quality and consistency is reflected in every aspect of our organization from customer service through the shipping department right to your department. ANSI / ISEA 107-2015 is the American National Standard for High-Visibility Safety Apparel. The standard was approved in June 2004 by the American National Standards Institute, Inc.(ANSI) The standard development was done by committee with the Safety Eq uipment Association (ISEA) as the secretariat. Road construction, utility, police, and emergency medical services are routinely exposed to the hazards of low visibility while on the job. The new standard provides guidelines for the selection and use of high visibility apparel- such as safety vests , work wear and rain wear - to improve worker visibility during day, in low light conditions and at night. The ANSI 107-2015 standard has three classes of protective clothing based on distinct risk levels for personnel who face exposure to traffic hazards. The risk levels are determined by the speed of traffic, work environment and task load. Gerber offers a variety of ANSI 107-2015 garments to provide safety through improved visibility in all types of conditions. Gerber uses 3M Scotchlite Reflective Materials and high visibility Viz Tech Background Fabric for unmatched performance.